Nelufar is a multi award winning journalist and presenter who has worked across American and British Television. 2019 saw her join Morgan Freeman as a contributing presenter on season 3 of Story of God for Nat Geo. Nelufar was also the host for the eight part series The Traffickers (Fusion/Netflix), which saw her following the illegal trades of precious minerals, counterfeit drugs, endangered species and even people around the globe. She travelled through Africa, Asia, Europe and the Americas as she chronicled the profit-driven dealers, compliant middlemen, bribe-taking officials, poachers and smugglers and uncovered vast transportation networks, packaging factories and safe houses. The unique way the series covered a broad but bold range of subjects with incredible depth of research and investigative efforts heralded the team and the programme a plethora of awards and nominations. These include Livingstone Awards for Excellence in Reporting, International Affairs award at the Association of International Broadcasters 2017 and Best Investigation at the Asian Media Awards 2017 as well as the coveted Reporter / Correspondent of the year at the Gracie Awards (the Alliance for Women in Media) and Journalist of the Year at the Asian Media Awards. Individual episodes including Killed for a Horn, Dark Side of Adoption and Fake Parma were finalists or shortlisted for awards including the Edward J. Meeman Award for Environmental Reporting at the Scripps Howard Awards 2017. 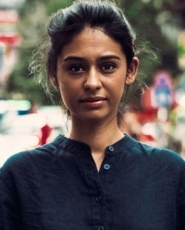 As a result of her reporting in Organs for Sale, Nelufar Hedayat was invited to the Vatican, to the Summit of the Pontifical Academy of Sciences’ in order to report on her findings as well as to be a signatory on the Resolution on Organ Trafficking, which has recently been ratified by the Council of Europe. In 2018 Fusion Food Exposed with Nelufar Hedayat was broadcast that saw her look into our food industries from dairy and pork to water and waste. In each episode she explored the journeys our food makes and the processes that go into this ever growing and demanding market. Nelufar investigates what the growing demand costs the planet and the people growing our food. Previous to her work with Fusion, Nelufar worked across the BBC, Channel 4 and The Guardian. Her work has often focused on the cultural upheaval experienced by women, children and families in conflict zones and hostile places. In 2015, Nel was nominated for Journalist of the Year at the British Asian Media Awards following her second programme for Unreported World, Vaccination Wars, which was also nominated in the Best Investigation category. In this eye opening film she met the health workers risking their lives to vaccinate children against polio in Pakistan, where the Taliban actively target and kill polio health workers. Her first Unreported World was filmed in Vietnam, where she investigated how dog thieves are making millions in the highly lucrative and illegal dog meat trade and are stealing thousands of pet dogs from family homes to meet demand. Nelufar was also a reporter for Channel 4 News, covering domestic issues for the programme. In the six years Nelufar worked for the BBC, she presented, co-produced and wrote documentaries for television and radio, including the award winning Women, Weddings, War and Me, Shot for Going to School and Music, Money & Hip Hop Honeys. She also presented and hosted the flagship live news programme Newsround for 3 years winning an award for her short film The Kids of Kabul made for the programme. More recently for the BBC she has been a regular reporter on BBC One’s religious and ethics discussion show Sunday Morning Live. Nelufar has produced and written radio documentaries and features for BBC Radio 4 on Afghan child suicide bombers. the refugee crisis in Syria and Lebanon, and on faith and marriage for BBC 1xtra . Nelufar speaks four languages including Farsi, Hindi and Dari.